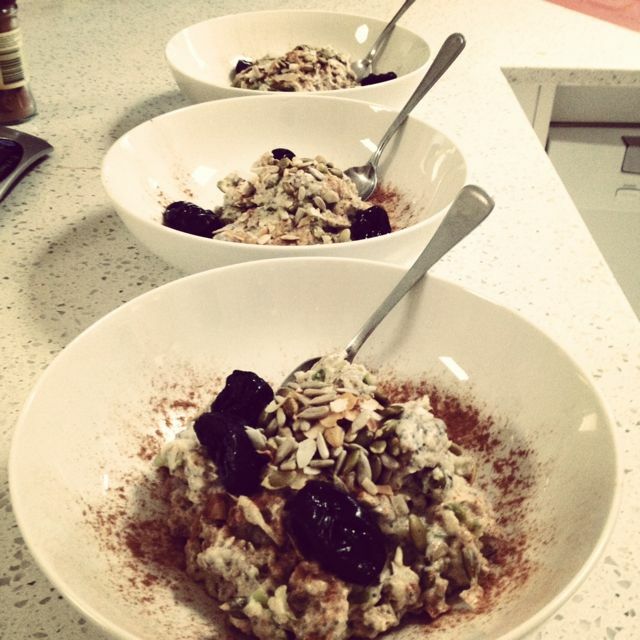 Nuts about nuts and our Primal Bircher Muesli Recipe. If you want our Primal Bircher Muesli recipe just scroll on down! What is your weakness? Lollies, chocolate, cheese, movie popcorn, greasy foods…the list goes on! The great thing with a paleo influenced diet is that there are alternatives for all these naughties—and we will regularly be updating our blog with delicious recipes. If you want the Primal Bircher Muesli recipe check it out below! But all is not well, we are having an issue with a paleo safe item. Nuts. Yes—we are nuts about nuts. Gone nutty with nuts. Completely over dosing on nuts…and it is time to stop. You may be thinking—but nuts are really healthy and there is nothing wrong with nuts. We agree, they are not only deliciously tasty (unsalted roasted cashews would have to be our favourite), they are packed with protein, antioxidants, vitamins, minerals, essential amino acids and good healthy unsaturated fats (monounsaturated and polyunsaturated). Fat!? That’s right, fat is not the enemy! However, nuts are not so healthy when consumed by the kilo (we were not exaggerating when we said overdosing)—nuts and seeds are a concentrated source of calories—and don’t forget, we also use almond meal as a flour replacement in a lot of our cooking. What is almond meal? Ground almonds. MORE NUTS! So it is definitely time to back off on the nuts. Summer is just around the corner and this year we plan on spending lots of time at the beach. How many nuts should we eat then? A serve of nuts is about 30g, so about a handful! Not a kilo. The great nut challenge begins! We are not going to completely stop eating nuts (that would be far too sad) but they’re going to have to be put on our ‘consume…but in moderation’ list. To help us out with this horrible, horrible task, we are going to try pre-packing our nut servings and mixing them with toasted coconut and a serve of chopped veg. Yum! Disregarding all we just said, here is a primal friendly breakfast full of what? Of NUTS! Mix all ingredients (except the garnish) in a bowl. Garnish with your selected nut topping. Now go and enjoy that delicious, delicious breakfast. If you have the time, toasting the pumpkin seeds, sunflower kernels and shredded coconut makes this brekky even tastier. Simply place them on a lined baking tray and bake on 180 degrees for 5-7 minutes (until golden). *if you follow a paleo/dairy free diet, swap the yoghurt for almond milk.